The tradition of serving hommus swirls in round clay dishes has been around the Levant for years. Hommus is now global, considered hip and healthy. When you go to the supermarket you may find it difficult to chose a brand or variation. Tubs of classic hummus line the shelves alongside white beans hummos, edamame hummos or beetroot hommus. However delicious these may be and as far I’m concerned, they are not hommus at all! Let me explain: hommus in Arabic means chickpea – the legume – and does not mean a type of purée. Mashed and mixed with tahini it is referred to as hommus bi tahini – chickpeas with tahini. 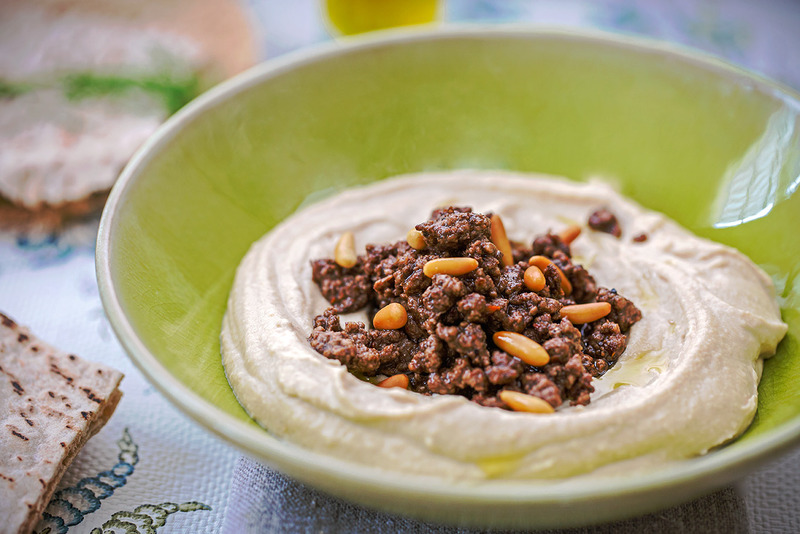 There are many ways of cooking hommus – chickpeas, but it is hommus bi tahini that serves as a base for traditional toppings such as pine nuts tossed in hot butter, whole chickpeas dressed with garlic and olive oil or a dollop of warm minced meat. Not long ago people used qawarma as topping- mutton mince, cooked with spices and confited in fat. The latter came from the large tail of a hardy breed of sheep. Using liyeh or fat tail has been around Arab cooking for centuries In many Lebanese and Syrian homes qawarma was staple in the store cupboard. It provided protein and fat while adding body and ‘umf’ to dishes; my grand mother often fried eggs with a spoonful of qawarma prompting lip licking excitement. People’s way of life and diet changed and their taste buds followed suit. The strong pungency of lamb no longer appealed to younger generations and qawarma is often replaced by lean minced meat cooked in oil as is in the recipe that follows. Place the chickpeas in a food processor and grind for 5 minutes. The blend at this point will look thick and granulated. Add the garlic, salt and 2 ice cubes. The ice helps to soften the mixture. While the machine is running, incorporate the lemon juice and olive oil; mix for 1 minute and add tahini. As the hummus thickens from the reaction of tahini and lemon, add 1 or 2 tablespoons of water to make it softer. Process until the mixture is smooth like soft cream. serve in a round dish. With the back of a spoon make a deep swirl in the centre of the chickpea paste and set aside. Heat oil in a heavy based pan sear the meat. Stir until the mince is cooked and a dark brown colour. Mix in the spices and sumac. Cover and cook on medium to low heat for about 8 minutes. When the meat is ready, taste and adjust the seasoning before spooning it over the centre of the hummus. Garnish with toasted pine nuts and a final drizzle of extra virgin olive oil.